Attainment Switch ($4.99 | iTunes App Store) - allows you to use iPod Touch/iPhone/iPad as a wireless switch. This app can communicate with any scanning enabled software running on a Mac or Windows computer. 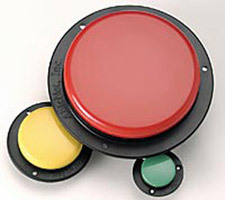 Features one- or two-button modes as well ability to use custom images. NOTE: Requires installation of FREE "helper" software on the computer as well as access to a WiFI network.